Exhibiting at events and trade shows can be seen as an expensive cost. However, if you plan your exhibition carefully, you can reuse the stand for different events, even when marketing messages change, and still be able to maximise return on your initial investment. Finding an exhibition kit to suit your budget can seem a lengthy process. Here at XL Displays, we want you to get the best available exhibition stand for your money. We know that budgets are often tight and as a successful business you need to be able to stretch your money as far as possible. The good news is that we can help you, whatever your budget, without compromising quality. Even with a limited budget, you need a stand that will attract potential customers with a careful selection of products and well-designed artwork. With many years of experience in the exhibition industry, our experts in portable display equipment and bespoke exhibition stands can provide exactly what you need at a price you can afford. 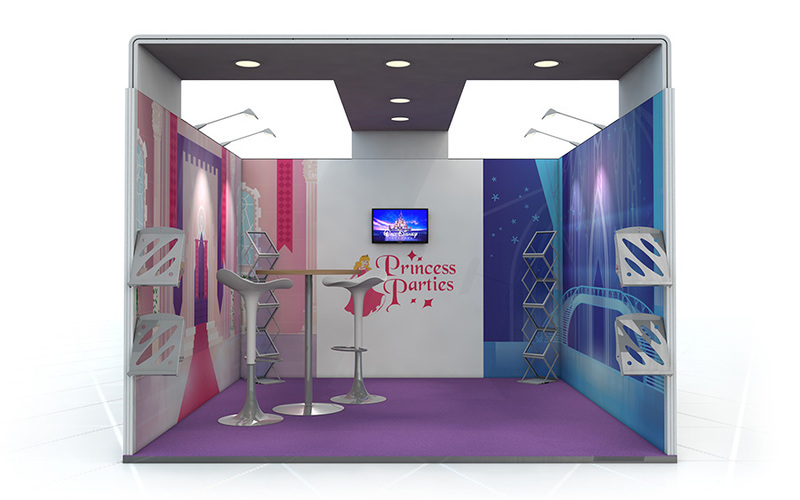 We can supply quality exhibition solutions that are tailored to your business and exhibition requirements. Ranging from a simple but effective roller banner to a custom built exhibition stand and everything in between. One of our expert sales advisors will work with you to understand your needs and explain the exhibition solutions that are available to you within budget. 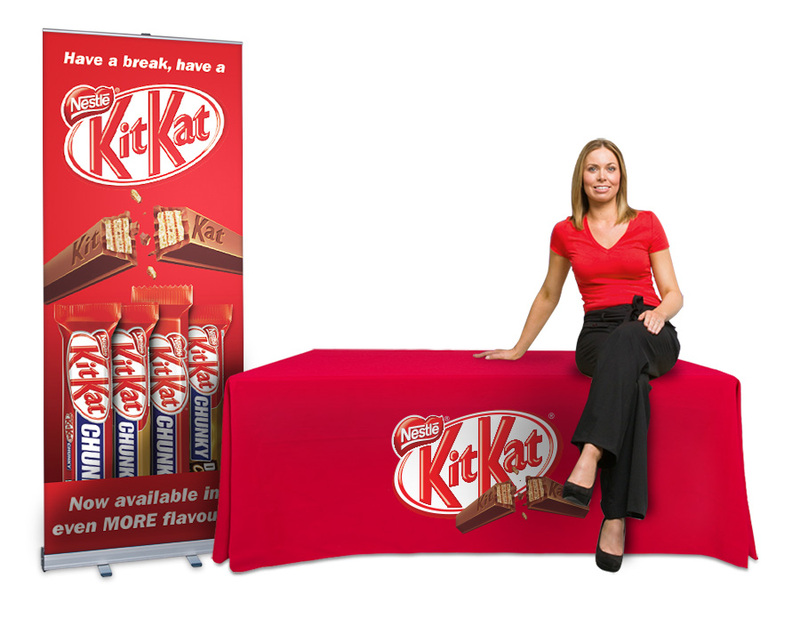 Our best-selling Grasshopper Roller Banner Stand is an ideal choice when you have a relatively small budget. Low on price, but high on features, our Grasshopper banners are manufactured using the same high-quality print and banner media as more expensive roller banners. 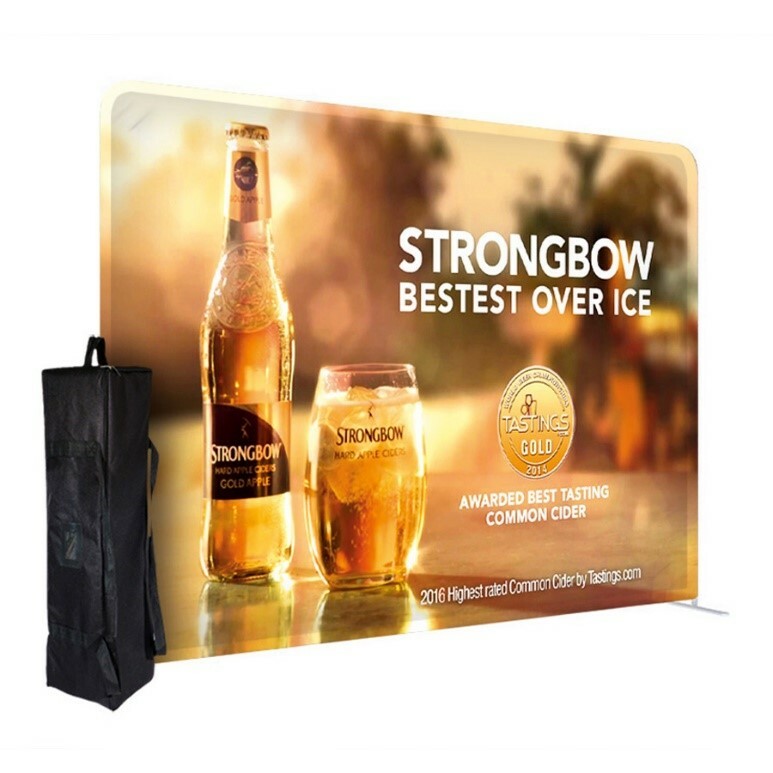 Lightweight and portable, they are an excellent starting point for novice exhibitors who want to add a dynamic marketing display solution to a basic stand to attract more visitors. Roller banners are great as they can be used on their own or as a new addition to refresh your existing exhibition kit. 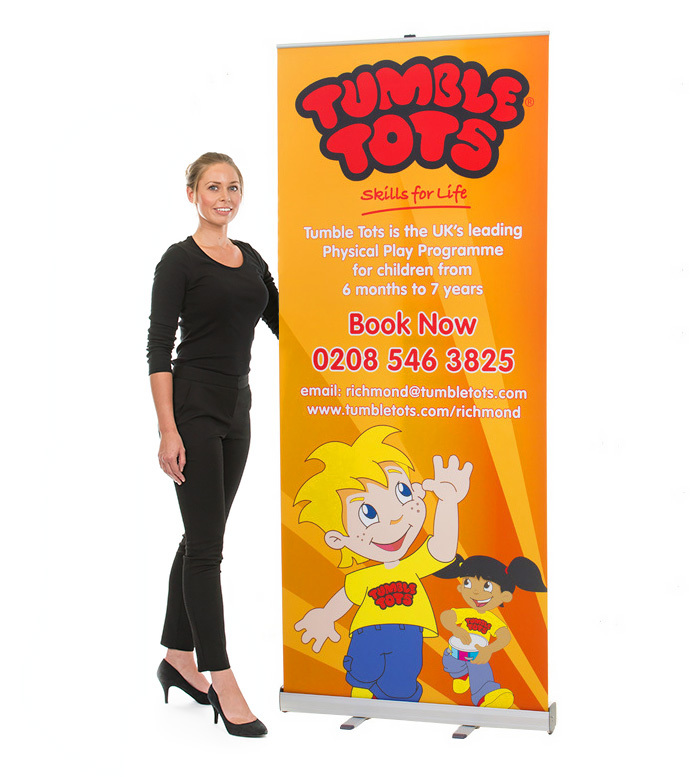 We have a wide range of roller banners to meet varying requirements suitable for both indoor and outdoor use. If you need some advice or help on choosing the right roller banner for your needs, please call us on 01733 511030. Another low cost but effective solution to a £50 budget is our Branded Table Runner Full Print. When attending events and exhibitions, having a professional appearance is vital. A fully printed table runner is a great addition to any stand and will ensure your display looks professional and stands out with edge to edge marketing opportunity. In terms of exhibition stand display solutions, you may think £100 may not get a lot. However, for just £95 you can upgrade your display solution to a ready to use exhibitor bundle with our Printed Tablecloth with Banner Exhibition Stand Bundle. This bundle includes a Grasshopper roller banner and a printed tablecloth with one printed logo in full colour. This bundle makes a great, multi-dimensional stand that is guaranteed to draw attention. If you’re looking to add to your existing exhibition stand then exhibition stand accessories like Leaflet Dispensers and iPad Stands are a quick and simple way to add an element of interactivity to your stand. Our Telescopic iPad Floor Stand is ideal for adding an interactive experience to your exhibition display, and provide quick and easy access to photo and video media to show visitors on your stand. This height adjustable iPad stand can be used time and time again and at just £58, is the perfect upgrade to an existing stand. 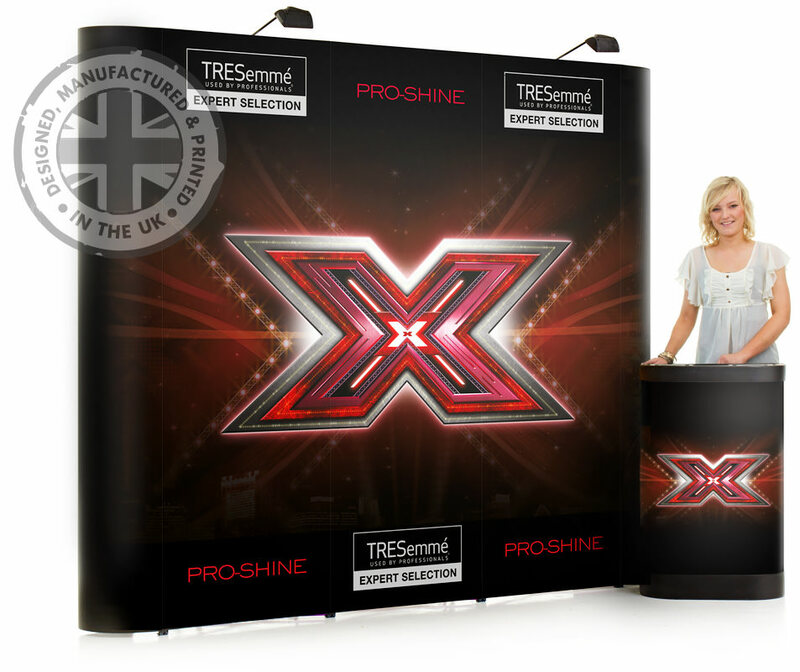 The 3x3 pop up exhibition stand is one of our best selling products. With a small footprint but large printed display area, a 3x3 is ideal for all exhibitions, showrooms, trade show events, open days and retail promotions. The exhibitor kit comes with all you need - 5 printed graphic panels, aluminium magnetic pop up frame, 18 mag bars, a portable case which transforms into a counter with graphic wrap, and two high power halogen spotlights to illuminate the display. Our kits provide you with everything you need for your event in an easy to use and portable format. No other modular exhibition display gives you the features and flexibility that our 3x3 pop up exhibition stand will give you. Alternatively, our Formulate Straight Fabric Display starts at just £355 and is an ideal back wall system suitable for a wide range of display environments. The ample graphic area is perfect for creating a stunning back drop for your exhibition space giving you a dynamic and attractive stand. With budgets of around the £1,000 mark, you can start to build more complex display solutions like linked pop up stands. 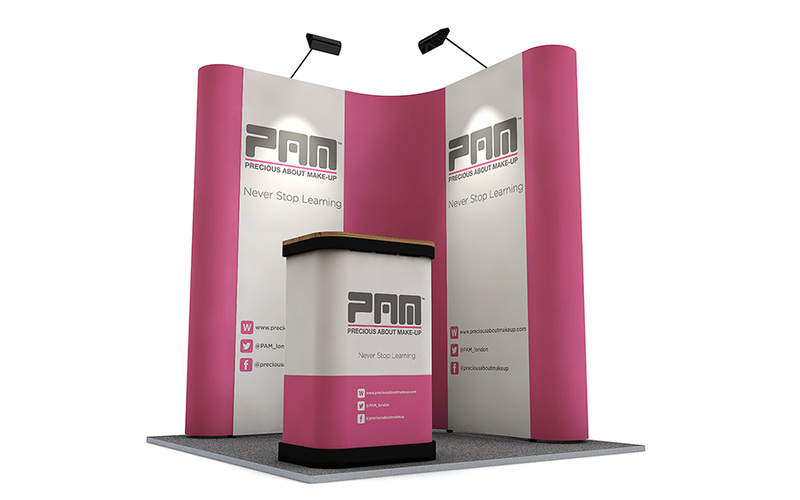 Our Linked 3x1 pop up stands are an ideal choice if you’re short on space but still want to create an impact and they are perfect as an exhibition starter kit for first time exhibitors. This L-shaped Pop up Display Stand is just £912 and is a cleverly constructed and designed stand that is the perfect starting point for exhibiting at larger or more elite events. The pop ups are lightweight and portable, and this size stand is easily assembled and disassembled by a single person. As your business and marketing budget grows, your linked pop up can also grow. New pop ups are easily added to your system in a range of configurations through the use of linking panels. Alternatively, you can use each pop up stand as a stand-alone display. If you’re looking for a superior exhibition stand that is going to attract crowds from across exhibition halls or large outdoor spaces, then our Inflatable Structures like the X-GLOO and Signus One are ideal. The X-GLOO is a striking inflatable event tent designed with the iconic shape of the igloo in mind and starts at just £1752. Offering limitless customisation and brand potential, the X-GLOO is a sturdy solution for any company looking for a striking and eye-catching presence at events. Sturdy and resilient, the tent is more than suitable for both indoor and outdoor occasions. 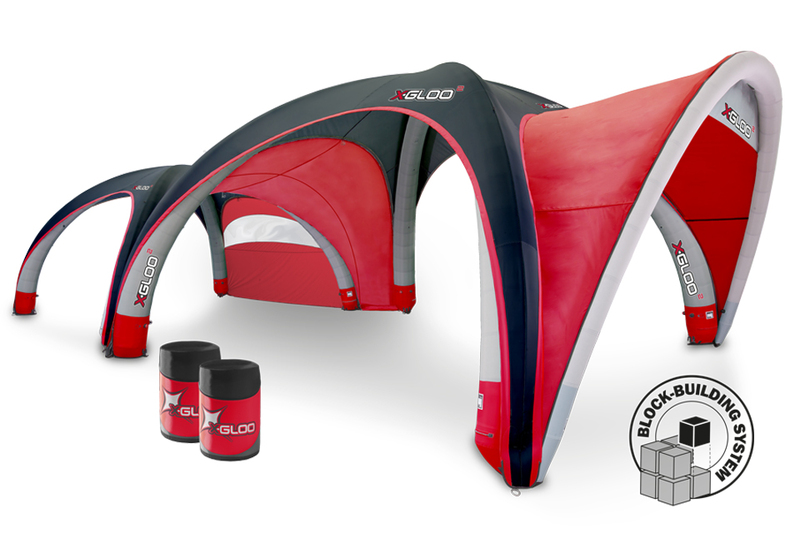 The X-GLOO tents incorporate a robust building block system allowing for endless configurations and customisation. Some of the optional components that you can add include walls, window walls, canopies and even other X-GLOO tents using the linking tunnel. This allows you to create a completely bespoke structure based on your marketing requirements. The Signus ONE is a fully customisable inflatable brand pavilion which provides a truly unique and eye-catching experience. The organic shape means there is no other inflatable event tent like it on the market. The one-piece construction features interchangeable cloths which allow you to switch your graphics effortlessly. The Signus ONE inflatable pavilion can be used both indoors and outdoors for all types of experiential marketing events and starts from £2695. With a budget of £5,000, you can upgrade your exhibition display to a more Bespoke Exhibition Stand. We have a wide range of bespoke stands including Linked Pop Ups, Linear and Vector, Shell Scheme and Centro Stands. There is a solution to meet any exhibition need and our Exhibition Stand category consists of lots of different configurations to inspire you in creating a perfect display solution for your marketing needs. This Linear Vector Exhibition Stand 3m x 3m U-Shape is just one example of our Linear & Vector Exhibition Stands. Costing £4,136, this stand is a perfect example of the type of stand a budget of £5,000 can give you. A completely bespoke stand, specially designed around your marketing needs. To find out more about how we can help you get the right exhibition solution, whatever your budget, please contact us or call our sales team on 01733 511030.